By Keith Silvas, Owner of Red Rock Home Inspections in Vista, Ca. California home inspection laws are addressed under the Business and Professions Code under sections 7195-7199. Sections 7195 defines a home inspection in California as a noninvasive, physical examination performed for a fee in connection with a transfer of real property (real estate). The home inspection should include an examination of the mechanical, electrical, plumbing, structural and other essential components of a residential dwelling of up to four units and is intended to identify material defects in the aforementioned systems. Section 7195 goes on to define a material defect as a “condition that significantly affects the value, desirability, habitability, or safety of the dwelling. Style or aesthetics shall not be considered in determining whether a system, structure, or component is defective.” From this definition, we can get a clear sense that a home inspection is not intended to find every minor maintenance issue or cosmetic flaw that may exist on a property. Still, your home inspector will likely provide information on how to properly maintain key components in the home to ensure the maximum serviceable life for the system. Section 7197 of the California Business and Professions code indicates that it is an unlawful business practice for any home inspector to perform or offer to perform repairs on a property that the inspection company has issued a home inspection report on within the last 12 months. This is to avoid any potential conflict of interest and prevent a home inspection company from taking advantage of the parties involved in the real estate transaction. If your home inspector advertised or mentions that they can complete repairs on the items they uncover during the course of the home inspection, they are operating not only unethically, but unlawfully as well. This has been set up for consumer protection. Please not, this section of the law does not apply to pest control companies licensed under the California Structural Pest Control Board, who may perform repairs due to wood destroying organisms discovered on the property. Under California law, only a pest control company licensed by the Structural Pest Control Board shall be permitted to identify the type of insect infestation that has caused damage to the property. This means that while your home inspector may identify damage caused by wood destroying organisms such as termites, wood boring beetles and carpenter ants, they are restricted from identifying precisely which insect is the culprit of the damage and as such should recommend further evaluation by a licensed pest control company. 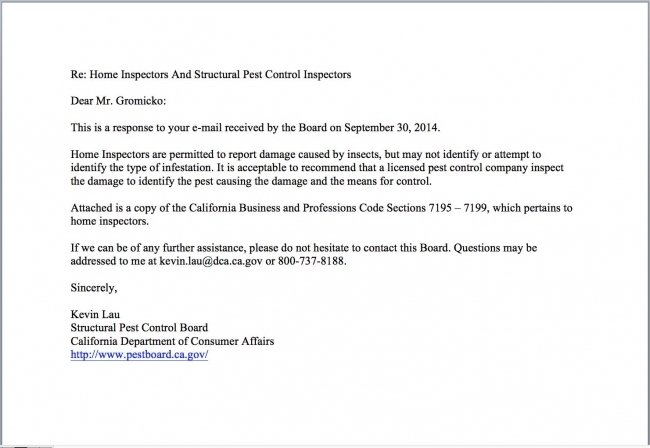 The Structural Pest Control Board of California has issued a letter to the President of the International Association of Home Inspectors regarding the limitations on what a home inspector can report on in regards to insect damage, you may view that letter here: Home Inspectors and Structural Pest Control Inspectors. Will you check the appliances for recalls? Do you include a 5 year roof warranty? Does your company include a sewer or septic warranty? What does your experience consist of? At Red Rock Home Inspections, we are proud to answer that yes, we offer a 5 year roof warranty, mold warranty, sewer/septic warranty, structural & mechanical warranty, appliance recall checks & lifetime monitoring for new recalls. These questions are a good starting point for narrowing down your choice of home inspectors. Since there are no licensing requirements for California home inspectors, it is strongly recommended that you do not choose the cheapest priced inspector you can find. It is also strongly recommended that your home inspector be affiliated with a home inspection organization. This ensure that your inspector has passed a certification exam. Also, in order to maintain membership, a minimum number of hours of continuing education are required by the member every year. Red Rock Home Inspections is a member of InterNACHI (NACHI ID: NACHI15011910). We hope this answers any questions you may have in regards to California Home Inspection law. It’s our goal to provide you with the tools you need to make the best decisions possible when entering into such a substantial investment as purchasing a home. We understand that your home is more than just a roof over your head.